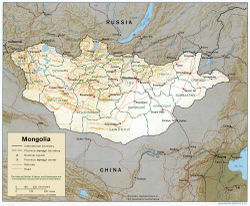 Mongolia ( Mongolian: Монгол Улс) is the largest fully landlocked country typically classified as being a part of East Asia, though it is sometimes considered as being a part of Central Asia instead. It is bordered by Russia to the north and the People's Republic of China to the south. 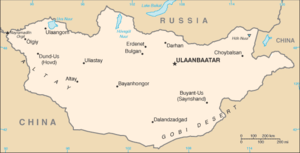 Its capital and largest city is Ulaanbaatar. Mongolia was the centre of the Mongol Empire in the thirteenth century and was later ruled by China during the Manchu Qing Dynasty from the end of the seventeenth century until 1911, when an independent government was formed with Russian assistance. Following the end of the Cold War, and after the fall of communism in Mongolia in 1990, Mongolia adopted a new, democratic constitution which was ratified in 1992. This officially marked the birth of Mongolia as a democratic country, making it one of the world's youngest democracies. At 1,564,116 square kilometres, Mongolia is the nineteenth largest country in the world. However, the country contains very little arable land as much of its area is covered by arid and unproductive steppes with mountains to the north and west and the Gobi Desert to the south. Approximately 30 percent of the country's 2.8 million people are nomadic or semi-nomadic. The predominant religion in Mongolia is Tibetan Buddhism, and the majority of the state's citizens are of the Mongol ethnicity, though Kazakhs and Tuvans also live in the country, especially in the west. About one-third of the population lives in Ulaanbaatar. A large number of ethnicities have inhabited Mongolia since prehistoric times. Most of these people were nomads who, from time to time, formed great confederations that rose to prominence. The first of these, the Xiongnu, were brought together to form a confederation by Modu Shanyu in 209 BC. They defeated the Donghu, who had previously been the dominant power in eastern Mongolia. The Xiongnu became the greatest enemy of China for the following three centuries; the Great Wall of China was built partly as defence against the Xiongnu. Marshal Meng Tian of the Qin Empire dispersed more than 300,000 soldiers along the Great Wall to prevent an expected invasion from the North. It is believed that after their decisive defeat by the Chinese in 428-431, some of the Xiongnu migrated West to become the Huns. After the Xiongnu migrated west, Rouran, a close relative of the Mongols, came to power before being defeated by the Gokturks, who then dominated Mongolia for centuries. During the seventh and eighth centuries, Mongolia was controlled by Gokturks, who were succeeded by the ancestors of today's Uigur and then by the Khitan and Jurchen. By the tenth century, the country was populated predominantly by Mongols believed to be a branch of the Xianbei. During this period the country was divided into numerous tribes linked through transient alliances. 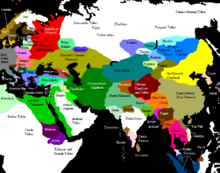 The expansion of the Mongol Empire. In the late twelfth century, a chieftain named Temujin united the Mongol tribes to the Naiman and Jurchen after a long struggle and took the name of Genghis Khan. Starting in 1206, Genghis Khan and his successors consolidated and expanded the Mongol Empire into the largest contiguous land empire in world history, going as far northwest as Kievan Rus. After Genghis Khan's death, the empire was divided into four kingdoms, or "Khanates." One of these, the "Great Khanate," comprised the Mongol homeland and China, and its emperors were known as the Yuan Dynasty. Its founder, Kublai Khan, set up his centre of administration in present day Beijing. After more than a century of power, the Yuan Dynasty was replaced by the Ming Dynasty in 1368, and the Mongol court fled north. The Ming armies pursued and defeated them in Mongolia, but did not conquer Mongolia. During the next few centuries, Mongolia was split between the Oirad in the west and the Khalkha in the east. Altan Khan united the Mongols briefly in 1571. After failing to defeat the Chinese, he made peace with the Ming Dynasty and instead focused on Tibet, eventually becoming a convert to Tibetan Buddhism. During the seventeenth century, the Manchus rose to prominence in the east, they conquered Inner Mongolia in 1636. Outer Mongolia submitted in 1691. For the next two hundred years Mongolia was ruled by the Qing Dynasty. During this time, the Manchus maintained their control over Mongolia with a series of alliances and intermarriages, as well as military and economic control. Several Emperors of the Qing Dynasty were born to Mongol mothers. With the fall of the Qing Dynasty, Mongolia declared independence in 1911. The new country's territory was approximately that of the former Outer Mongolia. After the October Revolution in Russia, Chinese troops led by Xu Shuzheng occupied the capital in 1919. The Chinese rule did not last: notorious Russian adventurer "bloody" Baron Ungern who had fought with the "Whites" (Ataman Semyonov) against the Red army in Siberia, led his troops into Mongolia and forced a showdown with the Chinese in Ulaanbaatar. Ungern's cossacks triumphed, and he briefly in effect ruled Mongolia under the blessing of religious leader Bogd Khan. But Ungern's triumph was shortlived; he was chased out by the Red Army, which, while at it, liberated Mongolia from feudalism and insured its political alignment with the Russian Bolsheviks. In 1924, after the death of the religious leader Bogd Khan, the Mongolian People's Republic was proclaimed and was backed by the Soviets. The Mongolian People's Republic was aligned closely with the Soviet Union. Politicians who demanded a more capitalist course and who dissented against collective property, like Dogsomyn Bodoo or Horloogiyn Dandzan, quickly became unpopular. In 1928, Horloogiyn Choybalsan rose to power. Under his administration, forced collectivisation of livestock was instituted, and the destruction of Buddhist monasteries in 1937 left more than 10,000 lamas dead. During the Soviet-Japanese Border War of 1939, the USSR defended Mongolia against Japan. Mongolian forces also took part in the Soviet offensive against Japanese forces in Inner Mongolia in August 1945 (see Operation August Storm). The (soviet) threat of Mongolian forces seizing parts of Inner Mongolia induced the Republic of China to recognize Outer Mongolia's independence, provided that a referendum was held. The referendum took place on October 20, 1945, with (according to official numbers) 100% of the electorate voting for independence. After the establishment of the People's Republic of China, both countries re-recognized each other on October 6, 1949. After Choybalsan died in Moscow on January 26, 1952, Yumjaagiyn Tsedenbal took power. In 1956 and again in 1962, Choybalsan's personality cult was condemned. Mongolia continued to align itself closely with the Soviet Union, especially after the Sino-Soviet split of the late 1950s. While Tsedenbal was visiting Moscow in August 1984, his severe illness prompted the parliament to announce his retirement and replace him with Jambyn Batmonh. The introduction of perestroika and glasnost in the USSR by Mikhail Gorbachev strongly influenced Mongolian politics even though Mongolia was a sovereign nation. The collapse of communism in the Soviet Union and Eastern Europe, combined with these two policies, were enough to lead to a peaceful democratic revolution in Mongolia in 1990. This, in turn, allowed Mongolia to begin engaging in economic and diplomatic relations with the Western world. The nation finished its transition from a communist state to a multi-party free-market democracy with the ratification of a new constitution in 1992. Until June 27, 2004, the predominant party in Mongolia was the ex-communist Mongolian People's Revolutionary Party, or MPRP. The main opposition party was the Democratic Party or DP, which controlled a governing coalition from 1996 to 2000. From 2000 to 2004, the MPRP was back in power, but results of the 2004 elections required the establishing of the first ever coalition government in Mongolia between the MPRP and MDC (Motherland Democratic Coalition). The coalition broke down in January 2006, the current government has been formed with the MPRP, some small parties and some DP defectors. Mongolia's president has a symbolic role. Mongolia's Constitution provides three requirements for taking office as President: the individual must be a native-born Mongolian, who is at least 45 years of age, and who has resided in Mongolia for five years prior to taking office. The current President is Nambaryn Enkhbayar. Mongolia uses a unicameral parliamentary system in which the president has a symbolic role and the government chosen by the legislature exercises executive power. The legislative arm, the State Great Hural, has one chamber with 76 seats and is chaired by the speaker of the house. On January 14, 2006, the parliament's thirty-nine members, mostly MPRP but including four Democratic Party members ( Mendsaikhan Enkhsaikhan, Narantsatsralt, Mishig Sonompil, and J. Batkhuyag), overthrew Democrat Tsakhiagiyn Elbegdorj's grand coalition government. It has been claimed that this violated the Constitution, as the parliament exceeded its power. The decision to overthrow Elbegdorj's government was based on the MPRP Directing Board's decision, contrary to its three agreements with the Democratic Party. The action has been protested. Today you can find these people living well. The prime minister is elected by the State Great Hural. The current prime minister is Miyeegombo Enkhbold, who was elected by fifty-six votes to ten on January 25, 2006. The deputy prime minister is Mendsaikhan Enkhsaikhan (since 28 January 2006). The cabinet is nominated by the prime minister in consultation with the president, and confirmed by the State Great Hural. Mongolia maintains friendly relations with the United States, Russia, Japan, the People's Republic of China, and virtually all countries in the world. It has initiated large foreign investment initiatives and encouraged foreign investment. It supported the 2003 invasion of Iraq, or " Operation Iraqi Freedom," and has sent 200 troops to Iraq. On November 21, 2005, George W. Bush became the first ever sitting U.S. President to visit Mongolia. At 604,209 mi² (1,565,000 km² ), Mongolia is the world's nineteenth-largest country (after Iran). It is significantly larger than the next-largest country, Peru, and is nearly as large as the US state of Alaska. The Mongolian heartland consists of relatively flat steppes. The southern portion of the country is taken up by the Gobi Desert, while the northern and western portions are mountainous. The highest point in Mongolia is Nayramadlin Orgil (Huyten Orgil) at 4,374 m (14,350 feet). Uvs Nuur Lake, shared with Tuva Republic in Russia, is a natural World Heritage Site. Most of the country is hot in the summer and extremely cold in the winter, with January averages dropping as low as -30ºC (-22ºF). The country is also subject to occasional harsh climatic conditions known as zud or dzud. Ulaanbaatar has the coldest average temperature of any national capital in the world. Mongolia is high, cold, and windy. It has an extreme continental climate with long, cold winters and short summers, during which most of its annual precipitation falls. The country averages 257 cloudless days a year, and it is usually at the centre of a region of high atmospheric pressure. Precipitation is highest in the north (average of 20 to 35 centimeters per year) and lowest in the south, which receives 10 to 20 centimeters annually. The extreme south is the Gobi, some regions of which receive no precipitation at all in most years. The name "Gobi" is a Mongol term for a desert, depression, salt marsh, or steppe, but which usually refers to a category of arid rangeland with insufficient vegetation to support marmots but with enough to support camels. Mongols distinguish Gobi from desert proper, although the distinction is not always apparent to outsiders unfamiliar with the Mongolian landscape. Gobi rangelands are fragile and are easily destroyed by overgrazing, which results in expansion of the true desert, a stony waste where not even Bactrian camels can survive. The southern portion of Mongolia is taken up by the Gobi Desert, while the northern and western portions are mountainous. The aymguud are further divided into 315 somon (" districts"; sing. sum). Mongolia's economy is centered on agriculture and mining. Mongolia has rich mineral resources, and copper, coal, molybdenum, tin, tungsten, and gold account for a large part of industrial production. There are currently over 30,000 independent businesses in Mongolia, chiefly centered around the capital city . The majority of the population outside urban areas participate in subsistence herding; livestock typically consists of sheep, goats, cattle, horses, and Bactrian camels. Agricultural crops include wheat, barley, vegetables, and other forage crops. GDP per capita in 2005 was $1,900 . Although GDP has risen steadily since 2002 at the rate of 6.2% in an official 2005 estimate, the state is still working to overcome a sizable trade deficit. A massive ($11 billion) foreign debt to Russia was settled by the Mongolian government in 2004 with a $250 million payment; this reduced value was accepted due to Despite growth, the proportion of the population below the poverty line is estimated to be 36.1% in 2004, and both the unemployment rate and inflation rate are high at 6.7% and 10.9%, respectively . Industry currently accounts for 21.4% of GDP, approximately equal to the weight of the agriculture sector (20.4%). These industries include construction and construction materials, mining (coal, copper, molybdenum, fluorspar, tin, tungsten, and gold), oil, food and beverages, processing of animal products, and cashmere and natural fibre manufacturing. The industrial production growth rate is estimated to be 4.1% in 2002. Mining is continuing to rise as a major industry of Mongolia. Mongolia has increasingly started to develop its technology industry since the democratic revolution of the early 1990s, and many new technology companies have been founded. Also, some technology companies in nearby countries, such as South Korea and the People's Republic of China, have started to open offices in Mongolia. After the democratic revolution of the early 1990s, Mongolian domestic production has picked up providing basic food production to its residents through increasing competition among companies. According to the CIA World Factbook, in 2003, the service sector accounted for 58% of the GDP, with 29% of the labor force of 1.488 million involved. However, investment from Korea and other countries have helped add more paved roads and [?] to China, Korea, Japan, Germany, Russia, and other countries. The air transport company of Mongolia is MIAT. Petroleum products are to a large part (80%) imported from Russia, which makes Mongolia vulnerable to supply side shocks. This is one strong example of the influence of Mongolia's neighbors on its economy.